Registration opens on Saturday, April 19th, 2014. You can register online, ahead of time, and get a $5 discount. Online registration is highly encouraged and save you from waiting in line! Or, if it’s a last minute decision, you can still walk-up. Walk-up registrations will be for PM session only! Registration closes 12:00 PM on Friday, May 9th, 2014. BMWCCA is now requiring all NCC Autocross participants (for both events and schools) to be registered BMWCCA members. We realize that not all of our past event attendees are members. To help offset the cost of membership new BMWCCA memberships are entitled to one free NCC Autocross points event! BMWCCA membership is $48 which is a great deal. BMWCCA members enjoy a multitude of benefits such as discounts on hotel rates and towing services. Plus if you’re a BMW or MINI owner you get the extra benefit of dealer discounts at most MINI/BMW dealers and several local shops in the area. Signing up is easy! Simply go to"Become a Member, Autocross for Free!!!" and follow the posted steps. Make sure you complete step 3 after you complete your membership so that we can note your free event. Please register using Motorsport Reg here. Online registrations are done securely. Walk-ups are limited!!! The NCC Autocross program uses a BMW-centric customized classing structure which pits your BMW or MINI against similar performance models in 3 levels of trim: Showroom, Tuner, and Modified. There is also a simple classing structure for non-BMW competitors. You can check out the full details at nccautocross.com. Our program is beginner friendly, offering in-car instruction, guided course walks, and a dedicated group of organizers who are happy to answer any questions you might have or show you the ropes. Also, there are free loaner helmets available for use, so if you don't have your own helmet there is no need to go out and buy or rent one just to get a few fun runs in! Please contact us at info@nccautocross.com with any questions you might have. We'll be happy to answer your questions. 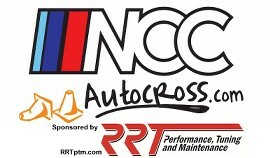 And check out our message board at www.nccautocross.com to discuss the event with other attendees! See you on the 10th and thank you for autocrossing with us!! *As always, event schedule is subject to change. Last edited by etherpool; 01-23-2014 at 02:38 PM. AM and all day sessions almost sold out! Get in quick! If a spot opens up in the AM session, please chime in - I am ready to take it! Will do. Nothing has opened up so far. Had fun yesterday. Thanks NCC staff. Here's my fastest run from the morning. Here's my fastest run from the afternoon, wet course. Hope everyone enjoyed themselves! Glad we didn't get poured on. Some pics from the event. Like us on Facebook if you haven't already! Thanks to all for another great event! Results are up!! What happened; did some folks not get classed correctly... I noticed there are a lot more folks in T3 on the corrected results!
" Vision without resources is just hallucination"
You got it. I thought of you when I saw how many people were in T3!! Yeap; gonna have to up my game because I figured with Christina in T2; T3 was going to be a lil easier but not so fast my friend! It will be a great season! Wow! I was joking, but I guess not. T2=Spec E36M3!